Other Common Names: Cilantro, culantrillo, dhania, Chinese parsley. The seeds are usually known as coriander while the leaves are called cilantro. 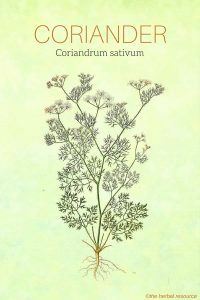 Habitat: Coriander is indigenous to the Mediterranean countries and today most of the commercial supply of the herb comes from Morocco, Romania, and Egypt. Plant Description: Coriander is aromatic annual plant of the parsley family (Apiaceae). It has slender stems with two types of lobed leaves and can grow up 90 cm or 3 feet tall. The leaves at the base are broad and resemble Italian parsley while the leaves on the stems are slender and feathery. The flowers are white with a hint of purple formed in clusters followed by round, ribbed, light brown seeds. The seeds have a pleasant aroma while the leaves have a stronger almost pungent odor. Plant Part Used: Seeds, oil and leaves. Both the [easyazon_link identifier=”B001A1VIUO” locale=”US” tag=”herbal-resource-20″]seeds[/easyazon_link] and leaves (cilantro) of coriander have been used in cooking for millennia, and coriander is considered one of the oldest spices in the world, probably dating as far back as 5000 b.c. Today, it is a major component in various traditional ethnic cooking. Traditionally, it is used to treat digestive and gastric complaints, small pox, nausea, anemia, fevers, measles, colds and hernias. 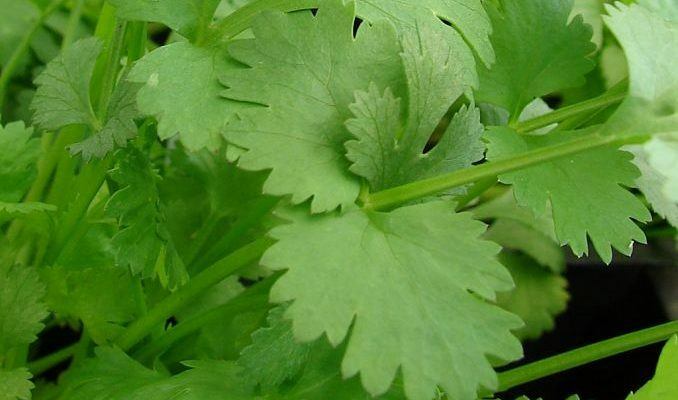 Coriander is considered a natural treatment for high cholesterol levels. There is some indication that the acids (linoleic acid, oleic acid, palmitic acid, stearic acid, and ascorbic acid) found in coriander might help to lower bad cholesterol (LDL) and raise good cholesterol (HDL). The herb can be used as a treatment for diarrhea because of chemicals found in the essential oil. These chemicals (alpha-pinene, beta-phelandrene cineole, borneol andlimonene) have both antibacterial and antifungal properties. It has a reputation as an appetizer and has been used to increase appetite in those suffering from anorexia. It is thought to improve digestion and help in the secretion of enzymes and digestive juices found in the stomach. Conjunctivitis is another ailment that’s treated by this herb due to its disinfectant and antimicrobial qualities. Licensed herbalists often recommend the following daily dosage. A daily dose is usually 3.0 g.
As an infusion: 1 cup between meals. As a fluid extract: Usually 5 to 30 drops. For commercial products of coriander always follow the manufacturer’s instructions. 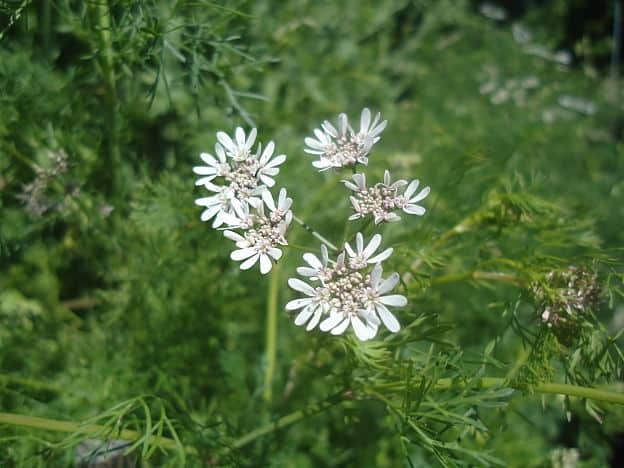 As a medicinal herb, coriander is usually considered safe. Because of the volatility of the seeds, they may cause an allergic reaction and some people may experience dermatitis after handling the leaves. Breastfeeding and pregnant women should not use excessive amount of this herb. Atkins, Rosie, et al. : Herbs. The Essential Guide for a Modern World. London, England. Rodale International Ltd. 2006. Duke, James A.: Herbs of the Bible. 2000 Years of Plant Medicine. Loveland, Colorado. Interweave Press 2000.